Volume 3: Social, Emotional, and Personality Development presentsup-to-date knowledge and theoretical understanding of the several facets of social, emotional and personality processes. The volume emphasizes that any specific processes, function, or behavior discussed in the volume co-occurs alongside and is inextricably affected by the dozens of other processes, functions, or behaviors that are the focus of other researchers' work. As a result, the volume underscores the importance of a focus on the whole developing child and his or her sociocultural and historical environment. The scholarship within this volume and, as well, across the four volumes of this edition, illustrate that developmental science is in the midst of a very exciting period. There is a paradigm shift that involves increasingly greater understanding of how to describe, explain, and optimize the course of human life for diverse individuals living within diverse contexts. This Handbook is the definitive reference for educators, policy-makers, researchers, students, and practitioners in human development, psychology, sociology, anthropology, and neuroscience. Richard M. Lerner, PhD is Bergstrom Chair in Applied Developmental Science at the Eliot-Pearson Department at Tufts University. He is the author of many publications, including Pathways to Positive Development about Diverse Youth and New Directions for Youth Development: Theory, Practice, and Research (Jossey-Bass). 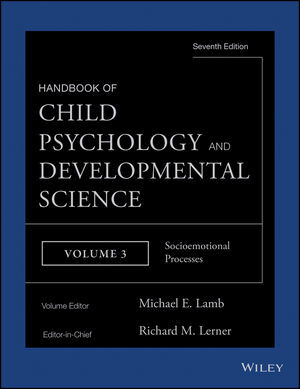 Dr Lerner is also a past editor of the Journal of Research on Adolescence and The Handbook of Life-Span Development (Wiley).